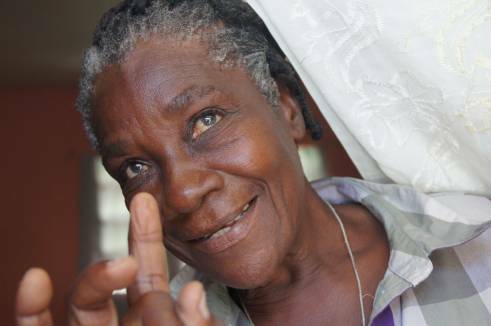 Five years on from the earthquake in Haiti that killed 230,000 people and displaced 1.5 million, HelpAge International has moved at least 1,000 older people into new homes. We have also set up 16 older people’s associations to provide long term support. Once in their homes, we provided older people with financial support for the first year after relocation. This enabled them to pay their rent, obtain health insurance and cover school costs for any dependant grandchildren. They were also given grants and training to set up a small businessof their choice, such as selling food or household goods. To prepare them for future shocks, we provided training in disaster risk management. This included developing a family emergency plan for each household. The earthquake destroyed 66-year-old Saintanne Jean’s home and she spent three years in a camp for displaced people in extremely difficult conditions. She was relocated by HelpAge International with the support of ECHO funding. “I now live in a clean, funished home and I’m independent,” said Saintanne who lives with her 9-year-old grandson in Croix des Bouquets. “I have my own key, a place for me, a kitchen and a bathroom. I can sleep safely while it rains. When I compare the conditions in the camp and my life now in this new house, I say it is the best gift I have received in my entire life,” she said. Saintanne said she was grateful to HelpAge for its support and was confident she could pay her rent in the future. We are committed to relocating a further 400 people into new homes by July 2015. More than 230,000 people died, 250,000 homes were destroyed and nearly 1.5 million people were displaced by the earthquake. At least 7% of the displaced were identified by the International Organisation for Migration (IOM) as people aged 60 and over. Older people in Haiti have no state pension, no access to credit and no legal recourse against family members who take their possessions. This all adds to them being among the poorest of the population, and more vulnerable to shocks such as earthquakes. Discrimination is at the heart of the problems faced by older women and men in Haiti and exclusion is one of the main causes of extreme poverty among older people. Older people are excluded from government, their communities and even their own families. To respond to this problem,we began setting up older people’s associations began in the camps six months after the earthquake. These grew into larger, communal associations that have been advocating nationally for the rights of older people ever since. The Haitian Government has recognised them as a national platform speaking on older people’s issues. “HelpAge International maintains a long-term commitment in Haiti beyond the emergency response. Our priorities include the expansion of the network of older people’s associations, the inclusion of their needs and a better understanding of emergency preparedness and response capacity.